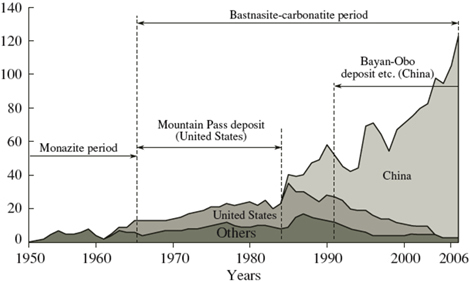 Rare earth metals have become increasingly strategic since the 2002 closure of the Mountain Pass open-pit mine in California USA leaving Chinese producers with 95% of market. The mine was closed due to low price of rare earth elements and environmental restrictions due to production of high amounts of toxic and radioactive thorium and radium contaminated waste water (the mine was discovered by a uranium prospector due to high radioactivity). Chinese productions has become increasing centralised and regulated to ensure supply to Chinese industry and to restrict pollution in China. Producers in other countries have warned that green technologies (like motors for wind generators, solar cell production) are reliant on the use of rare-earth elements. Mountain Pass production is being re-initiated with $500 million dollars spent to reopen and expand the mine (money raised by initial public offering of Molycorp) and was expected to be in full production by mid-2012. On September 22, 2010 China quietly enacted a ban on exports of rare-earths to Japan, which also produces a small amount of rare earth elements itself. Recently China has policy of reducing exports of rare earth and consolidating mining into state-owned companies. Other countries have protested these moves, but China cites environmental reasons which is an exception under World Trade Organisation agreements (China Joined in Nov 2001). I think there case is strengthened by the fact that only 35% of proven reserves of rare earth elements are in China but 95-97% of production takes place there. According to UK Parliamentary Office of Science and Technology, companies which process rare earth materials deal with processing of rare earth materials may face shortages, but since China seems happy to export products made from rare earth materials, like motors, companies making electric vehicles or wind turbines are not yet alarmed. Neodymium, praseodymium and dysprosium can be used in motors. Currently 4% of motors used in wind turbines use rare-earths but the figure is anticipated to rise. Rare earth elements are usually regarded as the lanthanides, scandium and yttrium, as all exhibit similar chemical properties. Global production is around 124,000 tonnes in oxide form. Major mining initiatives are under-way in reopening of Mountain Pass, and two sites in Australia; Mount Weld and Nolans. Each expected to produce 20,000 tonnes annually by 2013/2014. Table: Applications of Rare-Earths, Source: Parliamentary Office of Science and Technology, Note No. 368, 2011. Not all motors rely on rare earth magnets, or on permanent magnets for their operation. Japan have previously announced replacement of non-rare earth based magnets, Tesla Motors are an example of a company which has opted for induction motors for their electric vehicles (should necessitate use of inverter to produce AC current). Recently Hitachi have announced the development of a new motor with an iron core based on a proprietary amorphous metal. This means the core of the motor will be ferromagnetic rather than a permanent magnet and the amorphous metal is able to switch magnetisation with low hysteresis losses. How to make UK a developing country again? So many times on the radio or in new papers you will see reference to `developed’ and `developing countries’. This at best is a lazy description, since we are only considering the economies. In g.c.s.e geography I learned that we should call these as economically more developed and economically less developed countries. I really hate the term `developed country’, how will we have any growth/change in the economy if it can’t develop? Any idea how to make UK a developing country, ideally without destroying too much whatever progress we made in the past? You can see what HSBC think is the answer here (future of business). Pictures above will be explained, lots of new business should be developed in Cambridge… bio, nano, plastics, etc. 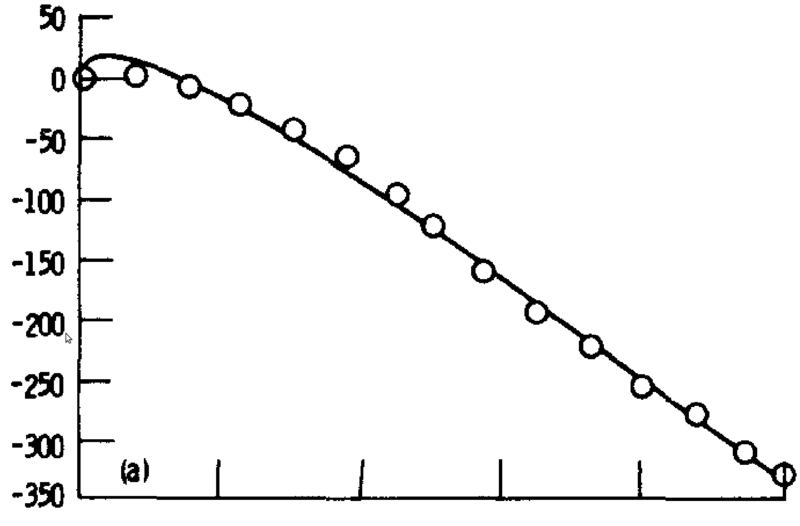 I digitised the following image using plot digitiser, which is a java program for getting numeric data from images. The horizontal image is scaled from 0-200 and is around 1272 pixels in length, this was acquired using print screen from pdf version of paper. I viewed the image on a flat–screen computer monitor (HPCompaq LA2505wg) with no additional magnification. 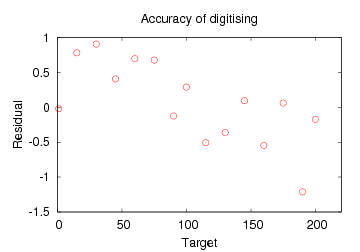 The positions of the ordinate values are known so can be used to assess the accuracy of digitising as shown in the second image. So in this case maximum error in measurement was around 0.5% of fullscale. Error across the measurements looks to be systematic so might have more to do with positioning of calibration markers than finding and clicking centers of the data points. Read an rysnc how to.